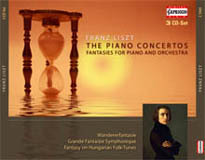 In Liszt’s two Piano Concertos we see his both spheres united: the revolutionary new techniques of playing that Liszt had wrestled from the piano during his years as a virtuoso and the orchestra works written on the basis of poetic ideas. His „Fantasies for piano and orchestra“ – these paraphrase’s to other works – the composer rather aimed at brilliance and virtuosity here. Not often performed this 3CD-Set includes all Fantasies for piano and orchestra as well than the popular two piano concertos. Inluding the famous Hungarian Rhapsodies Nos. 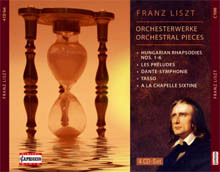 1-6 and „Les Préludes“ this 4CD-Set includes also some rarities of Franz Liszt compositions for orchestra like the Symphony to Dantes Divinia Commedia („Dante-Symphony“) or the Symphonic Poems „Tasso“ and „Mazeppa“. In those he reffered to Hector Berlioz, whose concept of an Idée fixe he appropriated like the technique of associative linking of themes. Liszt did not take a formal plan as the starting point for his compositions, but instead used a poetic-literary idea.